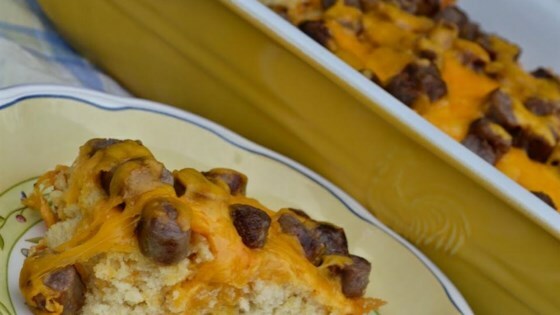 "A yummy and simple way to enjoy the flavor of pancakes in the convenience of a casserole. Always a big hit for breakfast, brunch, even dinner! Serve with maple syrup on the side, just like on pancakes. Everyone puts their own syrup on." Mix baking mix, 1 cup Cheddar cheese, milk, maple syrup, eggs, and sugar together in a bowl; pour into prepared pan. Bake in the preheated oven until a toothpick inserted in the center comes out clean, 20 to 25 minutes. Sprinkle bacon and remaining 1 cup Cheddar cheese over casserole; return to oven until cheese is melted, about 5 more minutes. Made exactly to directions, the family flipped! So easy and everyone loved it!!!!!! I made this dish, and it was super easy. Followed the recipe, only added a bit more bacon. Very good and the family loved it! Made it exactly as noted and it came out great. Great for a college student on a budget and I'll be making it again.